funkUs, performing live at The Plaza Theater, located at 425 North Bumby Avenue in Orlando, Florida, on January 16, 2013. The band was the opening act for Galactic, a jam band from New Orleans, Louisiana. 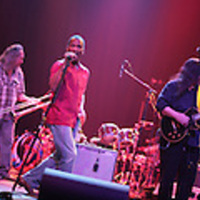 The first photograph features Adam Freeman on drums, Clay Watson on trombone, Eugene Snowden on vocals, and Dave Mann on electric guitar. 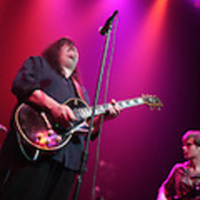 The second photograph shows Mann on electric guitar, Alessandro Ceserani on bass guitar, and Bill Bairley on keyboard. The third photograph features Mann and Ceserani, the fourth photograph features Freeman, and the fifth features Clay Watson on trombone. 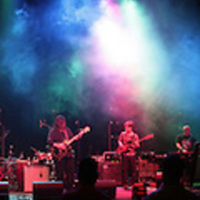 Formed in Orlando in 1998, funkUs earned a reputation as a band with a unique blend of eclectic musical genres, following in the footsteps of jam bands such as the Grateful Dead, the Allman Brothers Band, and Phish, by combining elements of rock, blues, jazz, rhythm and blues, and funk. 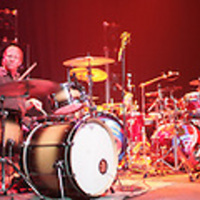 The band’s live performances incorporate an improvisational structure with groove-heavy rhythms. 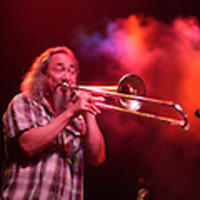 Their albums include flavor (2001); strobe light (2002); free (2005), which features Tom Constanten, a former keyboard player for the Grateful Dead; got problems (2009); funkUs meets the Curious Circus (2009); and coconut monkey (2012). Regularly performing throughout Florida, the band has appeared at premier music festivals, including the Purple Hatter's Ball in 2013, Bear Creek Music Festival in 2009 and 2011, Orange Blossom Jamboree in 2010 and 2011, Jambando in the Park in 2010, 2011 and 2012, and many others. They have shared stages with notable bands such as Galactic, Soulive, Dumpstaphunk, Robby Krieger of The Doors, Victor Wooten, Steve Kimock Band, Zach Deputy, and Consider the Source. The lineup is ever-changing, based around its core members: Adam Freeman on drums and percussion, Alex Ceserani on bass and vocals, Bill Bairley on keyboard and vocals, and Dave Mann on guitar and vocals. Original color photographs by Alicia Lyman, January 16, 2013: Archive: Concerts Archive, Alicia Lyman. Digital reproduction of original color photograph: http://alicialyman.photoshelter.com/gallery-image/2013-01-16-FUNKUS-THE-PLAZA-LIVE-Orlando-FL/G0000F75eYCWhCVY/I0000sTvtoceq7FM/C00004bs5i3cZxfk. Digital reproduction of original color photograph: http://alicialyman.photoshelter.com/gallery-image/2013-01-16-FUNKUS-THE-PLAZA-LIVE-Orlando-FL/G0000F75eYCWhCVY/I0000IN78g_a9elM/C00004bs5i3cZxfk. Digital reproduction of original color photograph: http://alicialyman.photoshelter.com/gallery-image/2013-01-16-FUNKUS-THE-PLAZA-LIVE-Orlando-FL/G0000F75eYCWhCVY/I0000Z5fghjKIE24/C00004bs5i3cZxfk. Digital reproduction of original color photograph: http://alicialyman.photoshelter.com/gallery-image/2013-01-16-FUNKUS-THE-PLAZA-LIVE-Orlando-FL/G0000F75eYCWhCVY/I0000eO7V.BRq_j8/C00004bs5i3cZxfk. Digital reproduction of original color photograph: http://alicialyman.photoshelter.com/gallery-image/2013-01-16-FUNKUS-THE-PLAZA-LIVE-Orlando-FL/G0000F75eYCWhCVY/I0000I.ooMyq1YQ8/C00004bs5i3cZxfk. Archive: Concerts Archive, Alicia Lyman. Originally created and published by Alicia Lyman. Copyright to this resource is held by Alicia Lyman and is provided here by RICHES of Central Florida for educational purposes only. Bolden, Tony. The Funk Era and Beyond: New Perspectives on Black Popular Culture. New York, NY: Palgrave Macmillan, 2008. Vincent, Rickey. Funk: The Music, the People, and the Rhythm of the One. New York: St. Martin's Griffin, 1996. Abbitt, Jim. “Jambando still jams after 10 years.” Orlando Sentinel. April 25, 2013. http://articles.orlandosentinel.com/2013-04-25/entertainment/os-jim-abbott-jambando-orlando-20130425_1_hindu-cowboys-music-fans-bonnaroo. Ruff, Emily. “Noodling towards Nirvana.” Orlando Weekly. March 18, 2004. http://www.orlandoweekly.com/orlando/noodling-towards-nirvana/Content?oid=2258931. Lyman, Alicia. “funkUs at The Plaza Theater, 2013.” RICHES of Central Florida accessed April 21, 2019, https://richesmi.cah.ucf.edu/omeka/items/show/5417.